NILPHAMARI, Bangladesh, Jan 25 2018 (IPS) - It’s nearing 4:30 p.m. on a foggy day, but there seems to be no great hurry amongst the workers to wind up their day in a factory producing high-end designer bags. Located in the Export Processing Zone (EPZ) of Nilphamari, a northern district 40 kilometers from the divisional headquarters of Rangpur in Bangladesh, the area is known for creating job opportunities for the local population. The female and male workers all seem fully engrossed in what they are doing and the atmosphere in the factory is a clear contrast to the noisy hubbub of trucks, buses, three wheelers and motorcycles outside. While the country’s garment industry is widely known internationally, the tragic deadly collapse of Rana Plaza a few years ago, which left over a thousand workers dead, remains etched in many people’s minds both at home and abroad. Less known is that the sector has opened up new income opportunities for Bangladeshi women. They have made enormous strides in the past decade, demonstrating how with even a small opportunity to gain skills, they can improve their own lives and those of their families. The production of thousands of designer bags that end up in the collections of affluent women worldwide and on catwalks internationally is taking place in some countries of the South, and Bangladesh is a prime producer. Several high-end brands are produced in one of many factories in the Nilphamari area that this IPS correspondent visited. One factory has 4,000 employees, of whom 70 are expatriates appointed by the foreign proprietors who are Hong Kong-based. Over 30,000 people are employed in such factories in the Nilphamari area, and 61 percent are women. A colourful spectacle unfolds each morning when almost 20 percent of the female employees ride bikes to work in the factories. This is considered quite a big change in a society where women were once relegated to work within their households. Amena Khatun, 35, who works for a leather factory, told IPS, “I was once unemployed. Now at least 2,000 women from my village of Balapara and two of its adjoining villages located some 10 to 15 km to the north of the EPZ are employed in 10 companies here. “Twenty years back, women in the villages had no job opportunities and were were hardly allowed to go outside their homes, let alone ride bikes,” she added. Afrina Begum, 32, a worker at a factory producing wigs and hair products, told IPS that even though the custom of dowry is still prevalent in the villages in Nilphamari, her husband had not demanded a dowry from her parents. Her husband had learned beforehand that she had an income every month as she was employed at a factory. Afrina added that women’s employment in the EPZ has played a major role in changing the outlook of men in a male-dominated society. The EPZ, defined as a territorial or economic enclave in which goods may be imported and manufactured and then exported without any duties and minimal oversight by customs officials, has factories producing a variety of products for export, including bags, wigs and toys with imported raw materials from China. The average wage for each worker in the factory producing designer bags is Taka 5600 per month (about 75 dollars) for both men and women. When asked, a couple of women workers said that their income has helped improve the quality of life of their families. Sahara Khatun, 26, said her husband left for Malaysia to work on a construction site. She lived with her parents and decided to ask them to help to look after her five-year-old daughter while she took on a job in the factory. Sahara said she has acquired skills and is now aware that only high-quality products have a market abroad. Most importantly, she is earning her own money and has a sense of independence and confidence. The factory has modern equipment with a design and technical centre. Young men and women work side by a side – a major breakthrough for conservative Bangladeshi society. One of the managers, Pijush Bandhopadhya, explained that all workers have know-how of each stage of production. There are close to 80 steps to be followed and implemented before a bag is ready. The leather, processed beforehand, comes from Italy and the cutting, glueing, and binding of the final product is handled by the factory workers under the supervision of a few expatriate experts. While the minimum age for employment in the factory is 18, a local government official conceded that many girls lie about their real age to qualify for a job. This has led to underage girls meeting a male coworker and ending up marrying. While child marriage is discouraged by the government, there are no mechanisms in place to prevent it. 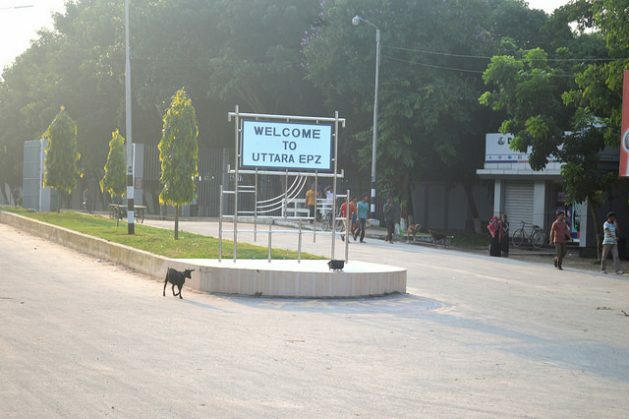 The EPZ, popularly known as Uttara (northern), was initiated in 2001 by the Bangladesh Export Processing Zone Authority (BEPZA), an official organ of Bangladesh Government to increase employment opportunities in northern Bangladesh. Pijush said the unemployment rate was previously high in Nilphamari district. Many people, mostly women, used to migrate to the capital city, Dhaka, or to other southern districts of the country in search of work in the garment sector. But now with the EPZ investment in the district, migration to the capital has fallen significantly. “This is only because jobs are now available in Uttara EPZ,” said Dewan Kamal Ahmed, the chair of Nilphamari municipality. Khaleda Akter, 37, of Kazirhat village adjoining Uttara EPZ in Nilphamari district, once worked in the Tazreen Fashion factory in Ashulia on the outskirts of Dhaka. She escaped a disastrous fire in November 2012 that erupted in the factory, as she had gone to visit her native village a week before. After the Ashulia fire incident, she did not want to go back and began looking for a job in the Uttara EPZ. “Luckily I got a job in Section Seven International Ltd. (Bangladesh) and since then I have been working here. Now I earn about Taka 10,000 (128.20 dollars) a month,” Khaleda said. An official of the Uttara EPZ who asked to remain anonymous told IPS that garment workers held a demonstration in 2010 to press their demands for implementation of new pay scale. But the protests only lasted a day because the government negotiated and met their demands. To remain a competitive supplier, production costs are low and most entrepreneurs, especially after the disastrous fire in the garment sector of 2012, are more conscious of the working conditions in factories, which have improved quite a lot, thanks also to regulations brought in by the government, stated Latif.